Project cargo Rotterdam - Mainport Warehousing B.V.
Mainport forwards project cargo by sea, air, rail, or by road. Our unique location at the port of Rotterdam literally places us in a position at the very heart of one of Europe’s most industrious hubs. Project cargo is delicately handled at the port of Rotterdam, stored, transshipped or forwarded. We use our own handling equipment for loading your precious cargo. 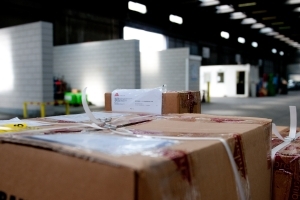 Services include door to door delivery across the globe, oversized and heavy cargo transports, packing and repacking, and lashing and securing project cargo at our bonded warehouse in Rotterdam. Project cargo transport is a tailor-made service that we provide from our location at the port of Rotterdam. If you are interested in this service, please contact Mainport and explain your current situation. Our specialists will find the perfect solution to your needs. Call the following phone number for more information: +31 (0)10 495 4360.